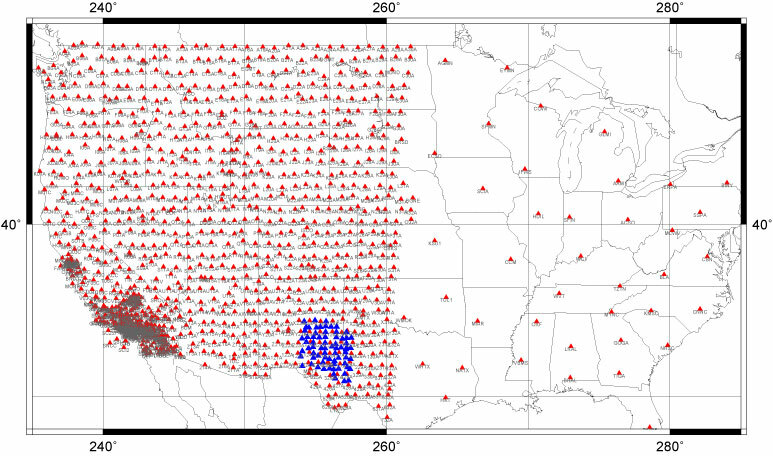 High resolution ambient noise surface wave tomography is being applied as the USArray Transportable Array (TA) component of Earthscope moves across the western United States. The method is applied both on a monthly basis and to the cumulative TA data set. Ambient seismic noise contains a significant component of Rayleigh and Love wave energy from which the Green function between pairs of stations can be estimated by cross-correlating long noise sequences. Surface wave group speeds are measured on the estimated Green functions. Early efforts were applied to records from USArray TA stations in Southern California and resulted in the construction of high-resolution short-period (7-18 s) surface Rayleigh wave group dispersion maps and the imaging of the principal crustal geological units in Southern California (Shapiro et al., Science, 307, 1615, 2005). As the spatial coverage of the TA has improved since the inception of USArray, the number of receiver pairs and the resulting inter-station paths have increased proportionately. We are tracking the TA to extend surface wave analysis by constructing cross-correlations between all contemporaneously located stations. 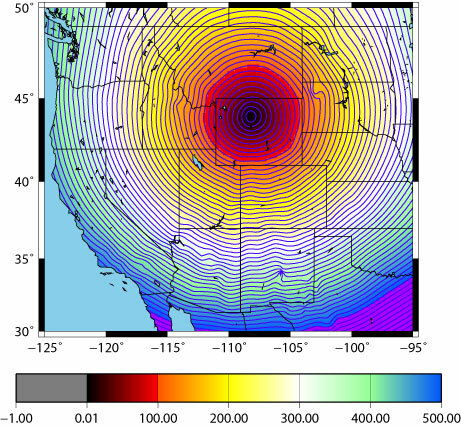 The purpose is to obtain short period (7-25 s) Rayleigh wave group and phase speed dispersion curves and velocity maps across the western United States. Newly imaged tomographic features are seen to emerge as TA stations are installed and then resolution (the clarity and reliability of the imaged features) improves. Here we present a sampling of the results, in particular images of Rayleigh wave phase speed maps at 8, 10, 12, 14, 16, 20, and 30 seconds period, resolution maps, and the ray paths used in each tomographic inversion for each month since October 2004. All of them are using a new technique named Eikonal Tomography developed by Fan-chi Lin. The depth to which surface waves are sensitive increases with period; e.g., 8-seconds period Rayleigh group waves are sensitive to a depth of about 10 km whereas the 25-seconds period waves are sensitive to depths of about 30 km. Resolution is reported as twice the standard deviation (two-sigma value, in kilometers) resulting from fitting a 2D Gaussian to the resolution kernel at each point. In addition, maps from the cumulative data are presented together with animations that highlight the improvements achieved as the TA grows across the western US. we use surface wave dispersion curves to constrain an isotropic 3-D model for western US. We use a Monte-Carlo scheme and the prior information of the depth of moho. Ambient noise tomography and multiple plane wave earthquake tomography are new methods of surface wave analysis that yield much more highly refined information about the crust and uppermost mantle than traditional surface wave techniques. 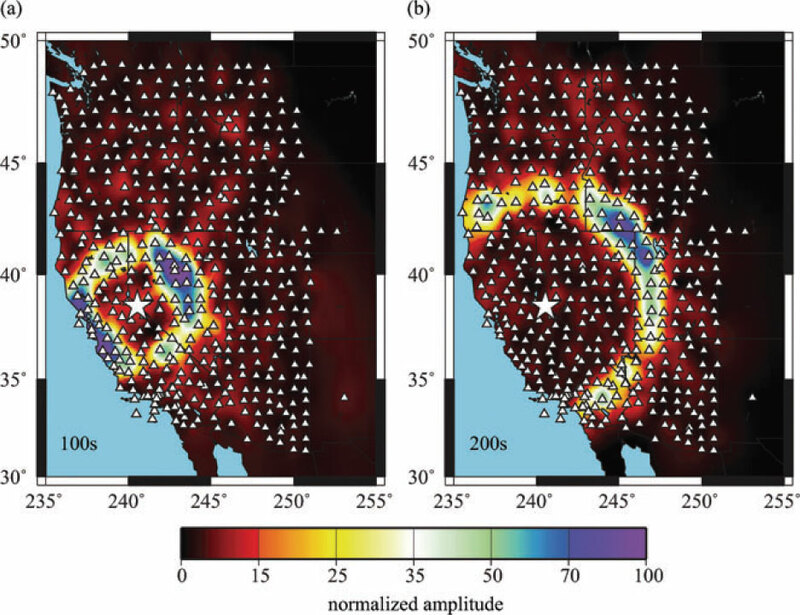 Applied together to data observed at more than 300 broadband seismic stations from the Transportable Array component of the EarthScope USArray, these methods yield surface wave dispersion curves from 8 to 100 s period across the entire western United States with unprecedented resolution. We use the local Rayleigh wave phase speed curves to construct a unified isotropic 3-D Vs model to a depth of about 150 km. Crustal and uppermost mantle features that underlie the western United States are revealed in striking relief. As the USArray continues to sweep eastward across the United States, the substructure of the entire country will be unveiled. We have derived a new method which can extract azimuthal anisotropy information from Eikonal tomography directly. Fan-Chi Lin has created example animations showing how energy radiates away from one station to all other stations. The animations are constructed in the following way. The 10-20 sec band-pass filtered cross-correlations between one common station and all other stations are used to construct the animation. First, the envelope function of each cross-correlation is calculated. For each snapshot, the value of the envelope function for each station at that instantaneous time is assigned to the location of each station. All the assigned values are then fitted with a smooth surface. The cold-blue color represents high of the surface and warm-black color represents low. The signal is observed to propagate outward with time. Ritzwoller, M H, Moschetti, M P, Yang, Y, Lin, F, Shapiro, N M (2007), Progress in Ambient Noise Surface Wave Measurements in the Western US, Eos Trans. AGU, 88(52), Fall Meet. Suppl., Abstract S43D-04. As this is a new technique, we are still determining optimal data processing procedures. The posted results reflect this fact. The monthly data stacks are processed using the procedure which was current at the time of processing. The cumulative stacks are processed using the most up-to-date procedure. Oct 2004 - Mar 2006 : Cross-correlations were calculated in three period bands (7-15, 10-25, 20-50 s). Frequency-time analysis (FTAN) was carried out in the three period bands. Data was selected based on the temporal signal-to-noise value of the waveforms in each period band. Apr 2006 - present : Cross-correlations are calculated on a broadband signal (5-100 s). FTAN was carried out in the period band 5-50 s. Data are selected based on spectral signal-to-noise values. Oct 2006 : We have begun to routinely process phase velocity data and present phase velocity maps at 8-, 12-, and 16-seconds periods. Dec 2006 : Fan-Chi Lin has been generating Love wave phase velocity maps of the western US region. Some of his results have been posted below. Dec 2006 : The spatial coverage of the Transportable Array is now sufficient to begin making Rayleigh group and phase maps at 30- and 40-seconds periods. We have previously been limited by the requirement that stations be separated by three wavelengths for a measurement at each period to be accepted. The spatial coverage of the TA now makes these intermediate period measurements feasible. Cumulative maps are posted, and these periods will become part of the routine monthly processing. May 2007 : Animations for several stations have been added to the site. These animations show the propagation of energy away from Transportable Array stations. This project is funded by the National Science Foundation - EAR 0450082. All data was obtained from the IRIS Data Management Center.